On our first day in Ubud we took a cooking class at Bumbu Restaurant. 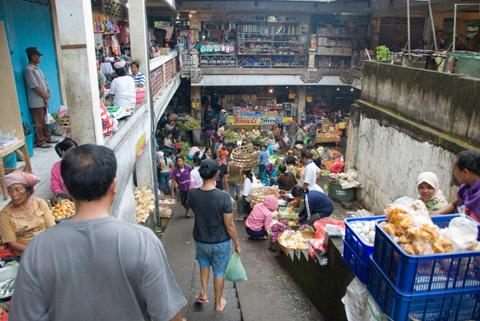 The class began with a tour of Ubud’s market. The market is busiest earlier in the morning so we went back for an earlier visit on another day. 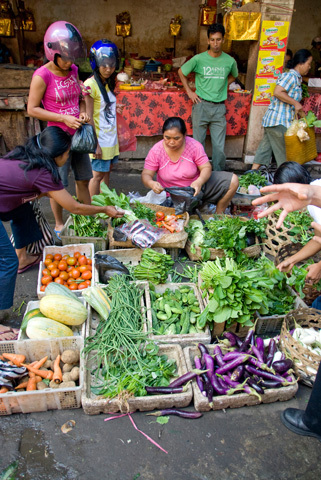 Our chef-instructor Gus showed us around the market and explained some essential ingredients of Balinese cuisine. I really enjoyed the tour, where we learned a lot of things that we probably wouldn’t have learned on our own. On the other hand, if you’re going to do some shopping, don’t do it with your tour group. The vendors know they can really stick it to you when you’re with the group. You’ve got a lot more freedom to haggle and shop around when you’re on your own. Another tip is to steer clear of the vendors in the areas that get a lot of foot traffic-they charge more than the vendors further back in the market. 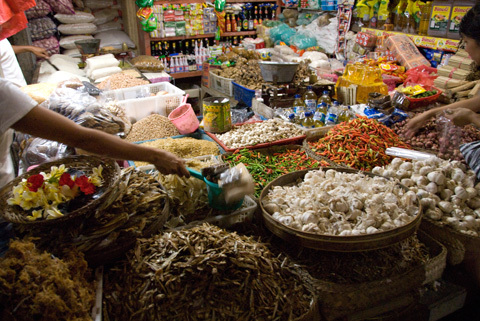 Near the market entrance you can find sellers with spices for basa gede (the basic spice paste that finds it’s way into nearly everything) like greater galangal, and the smaller and spicier lesser galangal, fresh turmeric roots, garlic, ginger, shallots, and chiles. The woman above is also selling palm sugar, tomatoes, and green bananas. These small, slightly wrinkled green chiles are spicy. 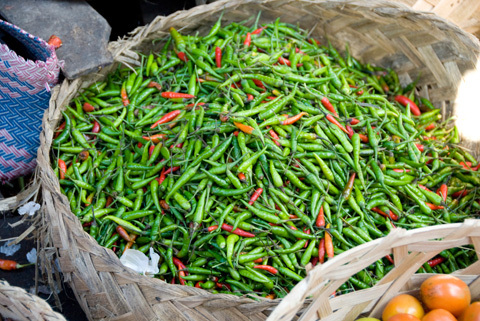 The larger red chiles (no picture) are called lombok chiles, and are not very spicy, more like a flavorful sweet pepper. 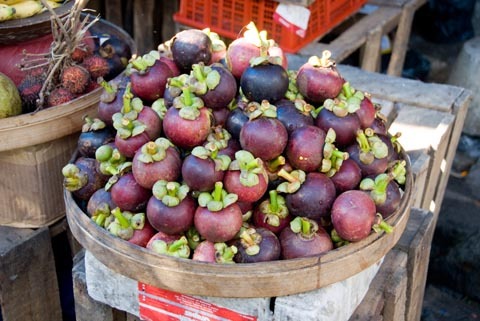 Vibrant purple mangosteens–a vendor showed us a trick to open them without a knife. Just clasp your fingers together and put your palms on either side, then give it a good squeeze. The fruit will pop right open with no mess. This works on passionfruit too. This ramp leads downstairs from the courtyard to the meat and vegetable sellers. Vendors alongside the ramp are selling peeled and sliced fresh fruits. 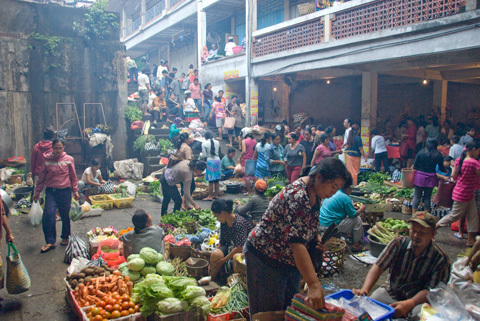 The view of the vegetable and meat vendors’ area. 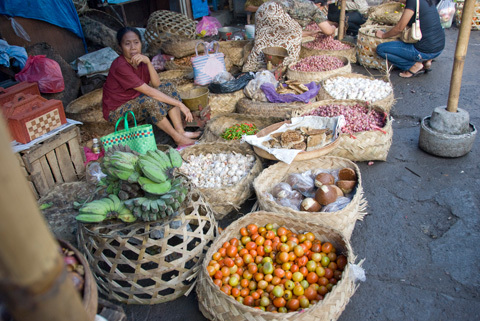 A vegetable seller with greens, eggplants, carrots, potatoes, and long beans. On the right you can see the hand of our chef-instructor, who is explaining the vegetables that we’ll use in our class later. Walk inside from the vegetable area and you will find cooking wares like mortars and pestles, wooden spoons, and coconut graters and then a maze of hallways leading to vendors with spices, dry goods, and dried fish. Here you can see dried fish, garlic, chiles, and rice. In the background are sauces and other essentials like fermented shrimp paste. 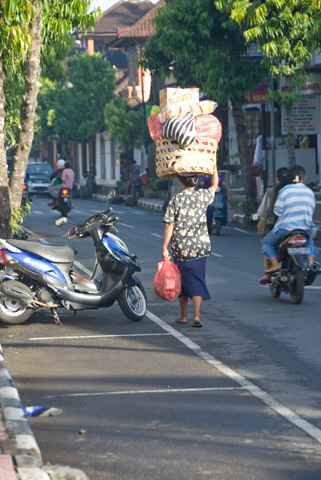 A woman walks home from the market with her shopping. Later, a watermelon fell out of the basket and started rolling down the street. Luckily we were able to catch it and return it, or who knows where it might have ended up. 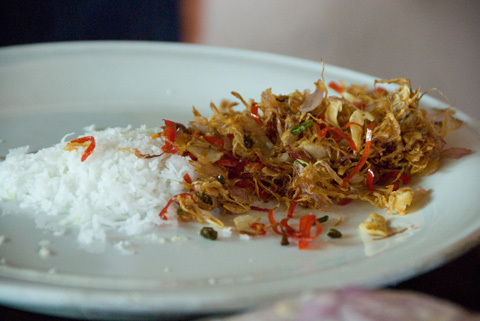 This is sambal goreng, or fried hot spices: chiles, shallots, garlic, and shrimp paste. 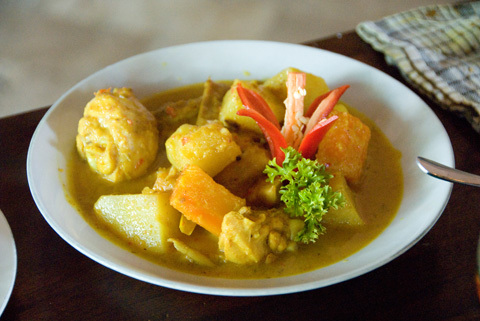 It is mixed with grated fresh coconut and then cooked vegetables to make sayur urab, mixed vegetables. This was one of my favorite dishes that we made: opor ayam, curried chicken. It was easy to make and delicious. I have made it a few times since we’ve returned to Japan–it took me a few tries to get the basa-gede right without fresh galangal, lemongrass, and turmeric but I think I’ve found some substitutions that work. I made sure to increase the amount of dried turmeric since the fresh root is much stronger. I added a yuzu half to the simmering curry; the aromatic citrus flavor replaces the scent of lemongrass. Finally I used ginger instead of galangal. Of course it’s not the same, but it’s the best I can do for now. Cut chicken into large chunks. Put chicken and basa gede in a pot and mix well. (Cook for a few minutes until fragrant.) Add enough water to cover chicken. Cover pot and simmer for 10 minutes. Peel the carrot and potato (and eggplant) and cut into chunks. Add to pot with salam leaves, lemongrass, and coconut milk. Cover and simmer for 15 more minutes until sauce is thickened and vegetables are cooked through. 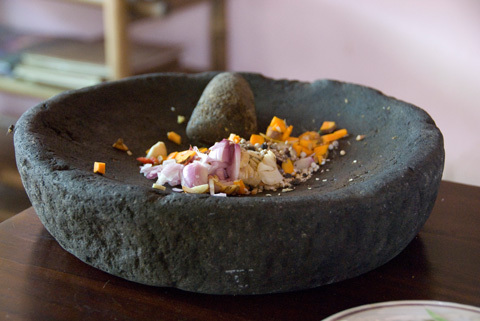 Pound all of the ingredients except oil and shrimp paste together in a mortar and pestle. Alternatively, grind dry spices in a spice grinder and then puree the remaining ingredients except shrimp paste in a blender (with oil in this case). Add oil (if you haven’t already) and cook in a skillet, stirring, about 5 minutes. Store refrigerated up to 3 weeks or frozen up to 1 month. When ready to cook, stir in shrimp paste and cook a bit more. Wonderful series of photos, interesting text and inspiring recipes!